This tool is a must for visual people! Symbaloo is a free visual bookmarking tool that allows you to keep track of all your favorite websites in an icon based grid that you can share, embed and even set as your home screen. All of your favorite web mixes are now just one click away! 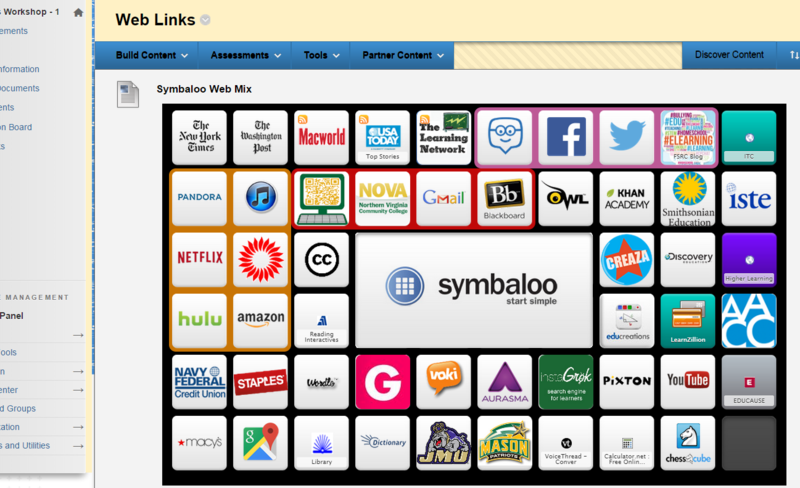 Symbaloo is an effective instructional tool that can enhance your course content. For instance, you are teaching a class where there are lots of great web resources for the students to use. You already have an extensive web links page in your Blackboard course. You can transform that list of links into an interactive webmix that can be embedded right into Blackboard. Let’s take a before and after look at your Web Links page on Blackboard. The first picture is your traditional Web Links page on Blackboard. Boring! Below is your updated Web Links page on Blackboard. Engaging! Is creating a symbaloo necessary to get your information across? No? But, it is a great tool to engage students and keep them interested in what we are presenting. Give it a try! You won’t be disappointed! Remember, stop by the Annandale FSRC in CG206 if you need any assistance with instructional technology. We are here to help. This entry was posted in Education/Training, Fun Stuff, Websites. Bookmark the permalink. Post a comment or leave a trackback: Trackback URL.